With iOS 7, Apple profoundly altered the foundations of their mobile operating system's design and functionality, and I want to believe that iOS 8, likely due later this year, will allow them to keep building towards new heights of user enjoyment, design refinement, and exploration of features suitable for the post-PC era. The transition to iOS 7 hasn't been perfectly smooth, but, less than two months away from WWDC, there's clear, promising potential on the horizon: plenty of new iOS low-hanging fruit. For the past two years, I've been using my iOS devices – and especially my iPad mini – as my primary computers: whether it's for writing, researching article and podcast ideas, doing email, listening to music, or playing videogames, the quantity and quality of time I spend on my iPad and iPhone far exceed the hours I sit down at my Mac with OS X Mavericks. I enjoy using my iPad more than my Mac: I wrote about my progressive shift towards an iOS-centric workflow on different occasions, and if there's a topic I could discuss without boredom, I would pick The Evolution of iOS any day. The iPad and iPhone changed the way I work, but I think iOS still has a long way to go. Last year, I wrote that I was more concerned about iOS' functionality than its looks. Looking back, I stand by that thought and realize that I wasn't really expecting iOS 7 to bring such a major redesign and reimagination of iOS. A year after that article, Apple has delivered on some of those requests (notably: background APIs, external keyboard integration, new Notification Center and App Store, Control Center) and provided a fresh design language focused on content and context. And yet, they haven't addressed the full spectrum of what could be possible on an iOS device – and understandbly so, because the company couldn't even ship a stable OS in time for its Fall 2013 release. For the sake of the “iOS Wishes” article that I like to publish once a year1, iOS 7 was a win on multiple fronts: its new design philosophy and technologies have created even more possibilities for new OS advancements; the hardware found in the latest iPhones and iPads (a desktop-class CPU, a motion co-processor, and Touch ID) feels like has only been scratched by iOS 7 and third-party apps. It's not just that Apple didn't include enough new features in iOS 7: it's the new OS and hardware that are offering new opportunities to think about the impact of mobile devices over the next five years. The result is the aforementioned 2014 iOS low-hanging fruit. It's not as obvious as 2009's “Apple should add copy & paste” or 2011's “The notification system really needs an update”, but it'll never be like that again for a simple reason: iPhones and iPads have become part of our daily lives, and what's obvious now would have seemed unreasonable or downright futuristic five years ago. Imagine going back to 2009 and telling your iPhone 3GS-carrying self that, by 2013, you'd be downloading apps by scanning your fingerprint on the Home button. On average, what we consider normal on iOS has deeply changed over the past few years and especially after iOS 7 and the iPhone 5s. Features from OS X Mavericks that would make sense on iOS 8. Some of these could be considered low-hanging fruit while others comprise specific nitpicking and cautiously optimistic productivity-related requests; generally speaking, all my wishes for iOS 8 come from the perspective of someone who relies on iOS 7 like everyone else but who also uses his iPhone and iPad for writing, photo management, file and text automation, and the big umbrella that is known as “work on iOS”. I recommend taking a look at my previous articles for iOS 6 and iOS 7 to see how they went. UI refinements across the board. The bold design direction introduced by iOS 7 came with a set of new problems. In an effort to prioritize content over heavy-handed interfaces, Apple got rid of familiar graphical elements and affordances such as outlined buttons, persistent toolbars, and other visual cues that, since 2007, had served as indicators of interaction and feedback. In apps such as Reminders and Voice Memos, it's not clear where taps are accepted anymore (and good luck trying to assume that a “+” button lets you add a todo in Reminders); for several users, iOS 7 made it harder to distinguish labels from buttons, editable content from UI, and inactive states from actionable areas. Apple needed iOS 7 to be out by September, and it wasn't perfect. The company spent the following months addressing motion sickness, lack of contrast, and legibility issues with Accessibility options that, however, often felt like backtracking on certain design decisions to give users options to tweak iOS 7 to their needs. My hope for iOS 8 is to see the iOS 7 design language leave behind its awkward teenage year and evolve into a mature, polished experience. Highlighting content over UI chrome is laudable and it has created a fantastic opportunity for developers to reimagine their apps, but a confusing UI is ultimately detrimental to the content itself if the user doesn't know what to make of it. At the same time, my wish is for Apple to truly take advantage of the iPad's canvas with unique designs that can only exist on a larger screen. Many Apple apps and system features feel like stretched out iPhone versions on iOS 7 for iPad, created in an effort to ship the OS beta in time, lacking imagination. Apple had a year to listen, and I hope we'll see the results with iOS 8. More Touch ID. On my iPhone 5s, I can unlock the device and download content from iTunes with a touch of my finger. Six months into using the 5s with Touch ID, I still find the technology amazing (especially after the speed improvements brought by iOS 7.1 and yesterday's 7.1.1 update) – but now I want more. Aside from a more consistent use by Apple (there are parts of iOS where authentication through Touch ID isn't accepted), I would love to be able to log into my favorite apps by scanning my fingerprint. A Touch ID API was proposed soon after Apple unveiled the technology last year, and while there are security implications – Apple likes to stress that third-party apps can't access your personal Touch ID data – it'd be great to have quick authentication into apps that usually require a 4-digit PIN through a Touch ID API. Apple's Phil Schiller declined to comment on this option last year. Lower iCloud pricing, offer higher storage tiers. For a company the size of Apple, iCloud is surprisingly expensive and limited: customers only get 5 GB of free storage, with the 10 GB, 20 GB, and 50 GB upgrades priced at $20, $40, and $100, respectively. By comparison, Google Drive comes with 15 GB of free storage, 100 GB at $1.99/month, and 1 TB at $9.99/month. Apple will tell you that iCloud does much more than Google Drive because it's not just document storage with sync (and that would be a simplification of Drive's offerings), but, assuming that such argument can be followed in 2014, isn't iCloud's seamless sync and push across devices a feature that is now expected by consumers on smartphones, tablets, and the web anyway? iCloud's free 5 GB plan works well for Mail and sync of Calendar and Contacts, but it becomes problematic when you add multiple device backups and start storing collections of documents in iWork and third-party apps. I don't know if the solution is to offer more GBs for free, lower the paid tiers, or a combination of both (make 10 GB the new free plan, lower prices and offer new 20 GB, 50 GB, and 100 GB plans? ), but the fact that there is no plan that matches a 64 GB iPhone's capacity – let alone a 128 GB iPad – is pretty telling. iCloud's plans were mostly okay for 2011, but in 2014 cloud services have changed and consumers demand more. If Apple wants customers to get more out of iCloud and enjoy it on all their devices, iCloud needs cheaper plans and new storage options. Quick reply to notifications. One of my favorite features of OS X Mavericks is the ability to quickly reply to incoming notifications directly from the notification banner. Whether it's an iMessage or a tweet from Tweetbot, clicking on “Reply” to act on a notification right away without switching contexts makes for a powerful, intuitive experience that Apple should bring to iOS 8 notifications. The screen constraints of iOS would turn quick reply into a modal view that takes over the current app with a compose box and the keyboard, but jailbreak tweaks like Auki have shown that the idea is feasible and potentially just as convenient as in OS X. I wouldn't go as far as wishing for full actionable notifications with embedded UI controls (such as turning off alarms or checking reminders from notification banners); just being able to reply to banners for messages and tweets would suffice. 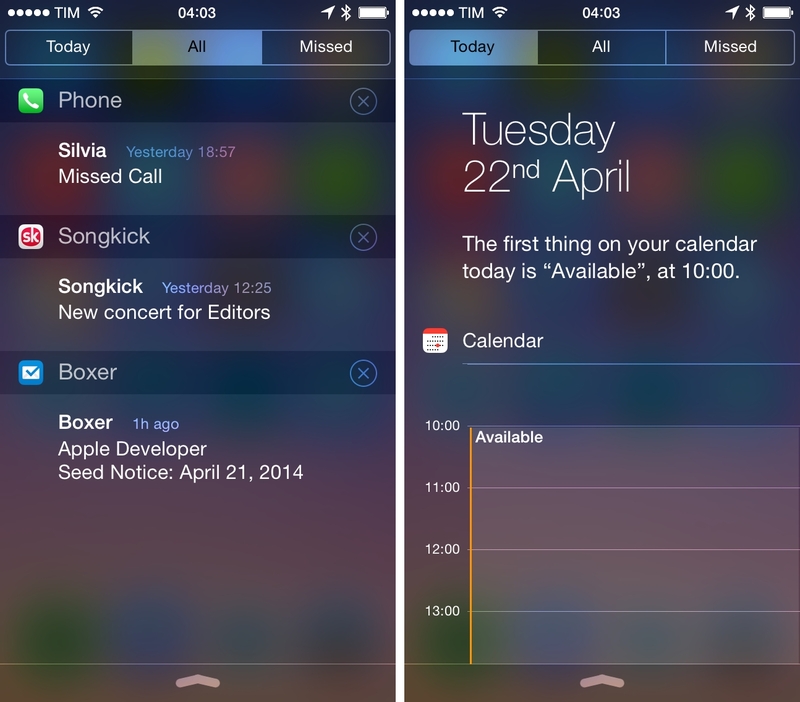 Simplify Notification Center, extend Today view. Nobody seems to understand how the Missed tab of Notification Center works2, and my real-world experience with iOS 7 suggests that most people tend to either look for All notifications or things that are due Today. I wouldn't be surprised to see the Missed tab of Notification Center disappear or be integrated with All notifications in iOS 8. The Today page has been a solid addition to my everyday experience, and I hope Apple had time to consider how it could become even more powerful in the future. Reminders and Calendar are useful data sources, but imagine being able to have a complete breakdown of the current day with todos and appointments from third-party apps or statistics on your daily physical activity. Apple could allow third-party apps to plug contextual information into the Today view, or perhaps use parts of the technology they acquired from Cue to make sense of a user's schedule by finding information in email and social apps. 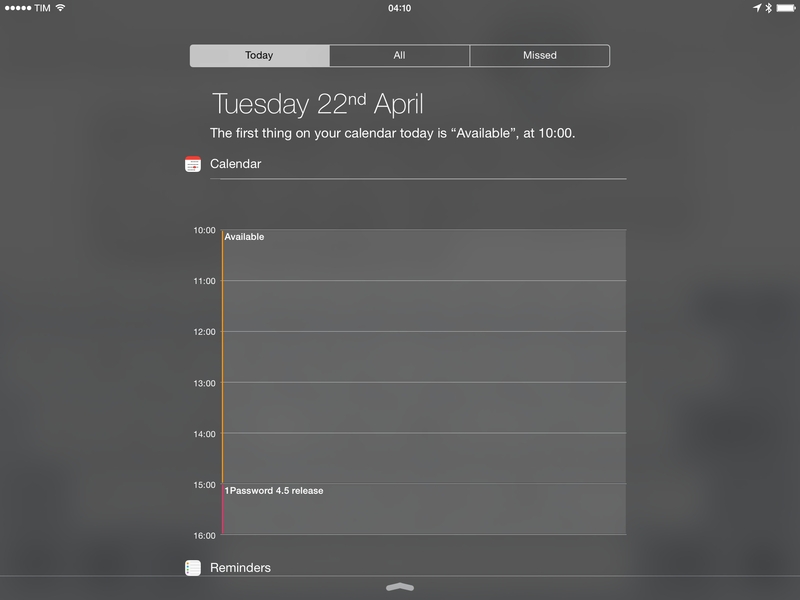 At the moment, it's not possible to choose which calendars show up in the Today view and All Day events have been mysteriously excluded as well; I'd like to see both in iOS 8. On the iPad, the Today view could take advantage of the larger screen to offer a more intriguing dashboard instead of an enlarged vertical list (apps like Morning and Status Board are inspiring examples). I want Notification Center's Today section to become a full-featured visualization of my day that I pick up in the morning to have a complete overview of the things I'll have to do, the places I'll need to visit, and all the data and connections in between. I can't help but feel that information from third-party apps and services will be crucial to take Notification Center's Today tab to the next level, although better integration with first-party apps and OS features could also be a nice start. Siri improvements. 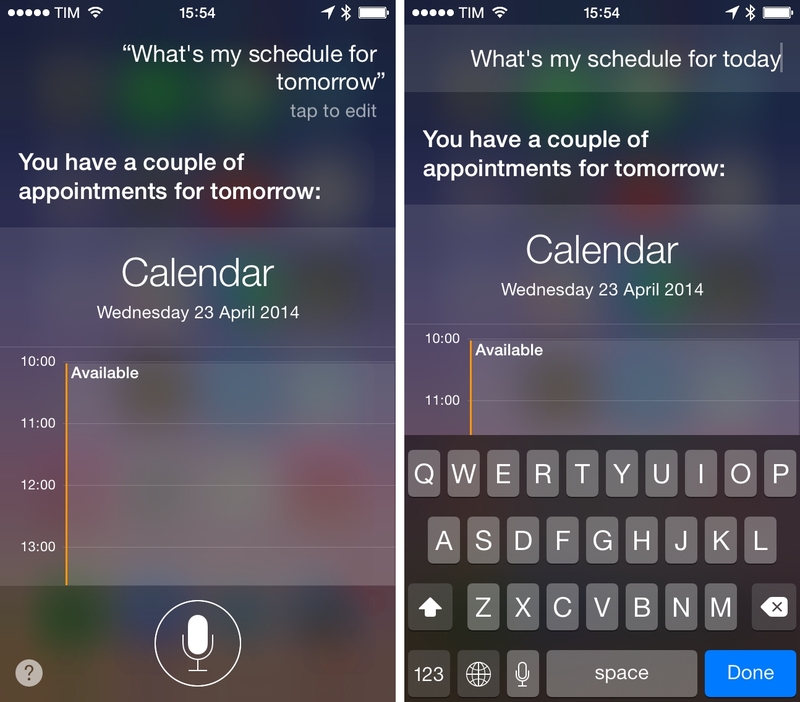 Changes to the text-based Today view should be followed by improvements to Apple's voice-based assistant, Siri. From a technical standpoint, Apple made good progress over the past year with Siri reliability and speed (note: I use the Italian Siri), but I believe the way Siri handles voice input recognition is still inferior to Google's Voice Search and even Microsoft's Cortana for Windows Phone 8.1. On iOS, you never know if Siri interpreted your voice command correctly until it gets a response back from the server, and if something went wrong during dictation (say, Siri misunderstood “three” for “tree”), you have to wait until it shows dictated text to try again. I don't know what trade-offs are preventing Apple from enabling live transcription, but I think that's a superior experience that iOS users should be able to have with Siri. Textual Siri. On the presentation side, I still believe that a textual interface would allow more people to rely on Siri when voice input/feedback isn't an option, such as public places; Microsoft got this exactly right with Cortana, which allows for both silent text input and voice commands. Furthermore, Siri's current start screen is fairly useless if you don't dictate anything to it, whereas Google and Microsoft have enriched their virtual assistants with dashboards that provide at-a-glance information without user input required. Siri offers a text editing mode, but it's limited to fixing previously spoken commands. Apple needs to decide whether Notification Center's Today view or Siri's start screen is the best candidate for a dashboard/assistant UI overhaul, but the competition has shown that it's possible to retain quick voice activation while also adding glanceable information for todos, location, news, and more. Person Reminders, Music ID in Siri. Other features that I've long wished for include “person-based reminders” and music recognition. The latter would enable a direct Shazam-like experience through Siri that's only a button press away (it could be beneficial to customers and it only makes sense when you think about Apple's huge iTunes Store database). According to Bloomberg, Apple is partnering with Shazam to offer music recognition in Siri. 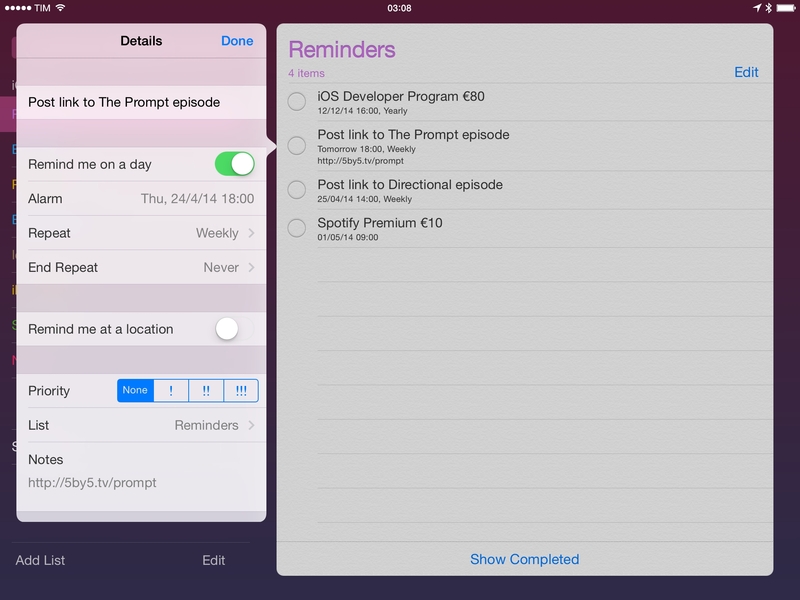 Person reminders could complement the current “where” and “when” layers of Apple's todo system with a “who” filter that reminds you to do something when you're with somebody. Cortana does both, and Google has allegedly been testing the “Who?” feature for Google Now as well. Open up Siri with an API. One of my regular wishes for the past three years, I hope that 2014 will be the year of Siri gaining the ability to talk to third-party apps to retrieve and send data without opening them. A Siri API would bring a voice layer to thousands of apps that are used by customers every day, allowing people to be more productive and connected without touch interactions. Apple can't expect to hardcode native Siri integrations for App Store apps and web services forever, and a Siri API could formalize a dictionary that apps could implement to be understood by Apple's assistant. Imagine asking Siri to “Text Stephen on WhatsApp” or “Get todos from Mailbox”, and you get the idea. A Siri API would bring a whole different set of challenges (do developers handle translated commands for international users, or does the API do that? ), but I don't see any alternatives if Apple wants to make Siri more flexible and powerful. 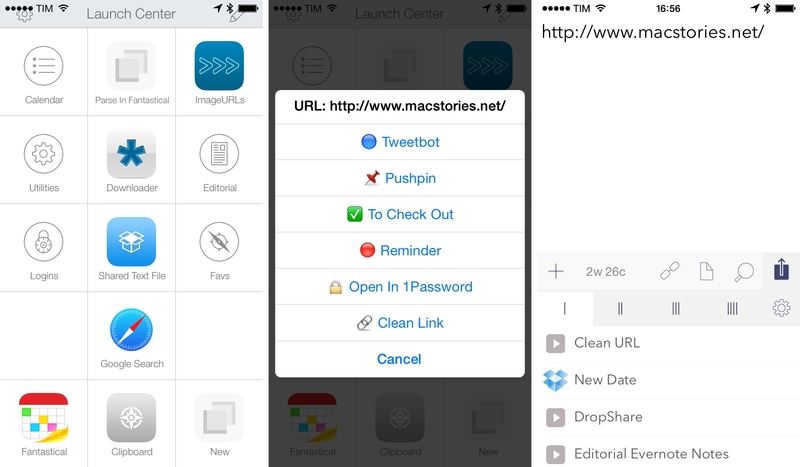 URLs in Reminders app. Apple should add support for tappable URLs in the notes field of Reminders, which was a strange omission in iOS 7 given that URLs are clickable in Reminders for OS X.
I'm nitpicking, but when I used to rely on Reminders for my todos I was constantly annoyed by the fact that I couldn't open links into Safari from the app. Better Maps data. Apple Maps has always been inferior to Google Maps for points of interest and local businesses in my area. Maps has gotten better over the past two years, but it still doesn't live up to Google Maps; errors that I reported months ago have never been fixed, and I know that this is a common problem that's not limited to Viterbo or Rome. There seems to be hope: Apple has acquired multiple mapping companies over the past year, and they're testing a notification system to inform users of Maps issues that have been fixed. Apple can't expect to verify all of the world's Maps data on their own: whether the solution is outsourcing to community-driven fixes, buying more location companies, or signing partnerships to provide local data (see Google Maps and PagineGialle.it in Italy), they have to iterate faster and at a larger scale. Separate languages for Maps navigation and iOS. You can set your phone to English and Siri in a separate language, but turn-by-turn navigation won't mirror the voice you set in Siri. In my case, I keep my iPhone in English and talk to Siri in Italian, but Maps gives me directions in spoken English. Why would a user want two different languages for voice interactions? I hope that this nonsense will be fixed in iOS 8. Completely rework Photo Stream. Apple's “solution” to keep your latest photos in the cloud is one of the most confusing, antiquated features that's still shipping on iPhones and iPads running iOS 7. Photo Stream is perplexing, laden with limitations, and it doesn't prevent customers from losing all their photos in case of device damage or loss. In 2014, it's almost too hard to believe that photos – according to Apple, one of the reasons why people buy iPhones – are tied to an outdated backup system that isn't built for true cloud storage and post-PC needs. Apple thinks that users want a stream of their most recent photos on all their devices. I don't think that's the case anymore. I believe that Photo Stream was a cool demo in 2011, but today users just want to take a lot of photos without losing them. They don't need a stream of recent items; they want available storage and a full backup of their photos without the complexity of iPhoto for Mac. Here's my take on how Photo Stream could be improved: iOS needs to provide seamless backup of all photos with no limitations for days or number of photos saved in the cloud. Because Apple is still selling iPhones with 16 GB and 8 GB of storage to customers and the average size of photos is only going up in the future, people shouldn't have to worry about freeing up space on their devices to take new photos or videos – which is a common occurrence that I witness every time I go to a concert, a family dinner, or spend a weekend with my friends. “I don't have enough space on my iPhone so I have to delete old stuff to take new photos”. This shouldn't happen anymore. Photo Stream should be renamed and relaunched to hold a full backup of photos in their original resolution, with filters to browse and organize those photos by location, event, time, person, or user-defined album. The integration with the Camera app should be seamless and reassuring: go ahead and delete old photos from your Camera Roll, you have them in iCloud anyway – that's what the Photos app should say to all those users who keep their entire photo collection from the past several years in the Camera Roll, taking up precious local storage. In my experience, normal people don't get Photo Stream, are confused by iPhoto, or don't have Macs; they keep all photos on an iOS device and regularly have to decide which old photos to delete to make room for new ones. Apple could launch a separate product and call it iCloud Photos, and the overhaul could easily be promoted alongside a change in iCloud pricing. People take a lot of pictures on their iPhones, and Apple should provide customers with a cheap, safe, easy solution to back up all those photos with the peace of mind that they will be securely archived and available in iCloud. Photo Stream can be convenient, but it's not the right solution for an important problem that still hasn't been fixed. Bring back Photos' Places view. With iOS 7, Apple changed the way photos with location information are displayed on a map, and I think that was a regression from the old system. On iOS 7, you can't view all photos from all years on a map at once: you can only tap on individual Years to view photos for that year on a map, whereas the old Photos app could show all photos from your entire Camera Roll. 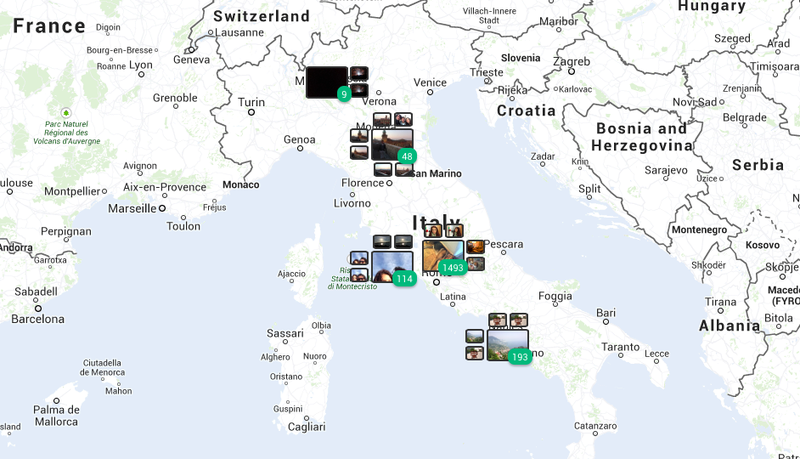 Picturelife's web app has a Places view to see all photos on a map. This is a seemingly minor change that, however, makes a big difference if you want to visualize your entire photo collection geographically. What I want is something similar to Day One for Mac's Maps view or Picturelife's web app, which prove that an elegant and functional implementation is possible. 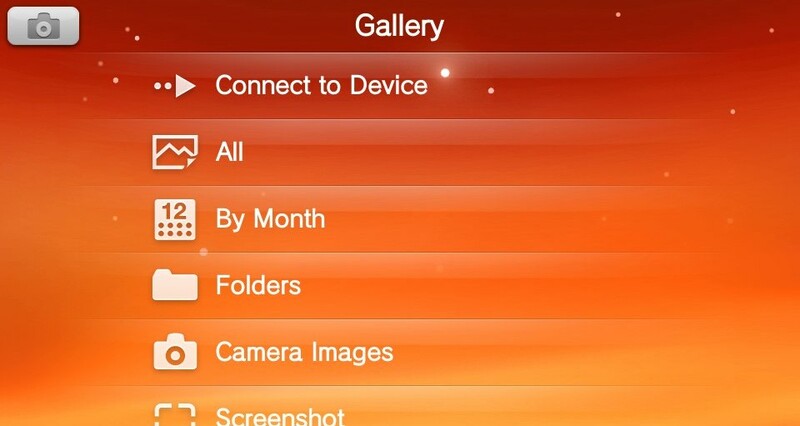 Above: Sony's Gallery app for the PS Vita. 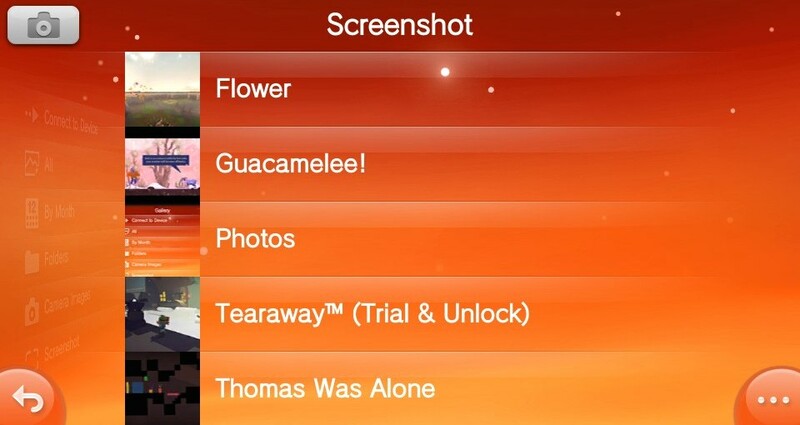 If Apple wants to go the extra mile with this, they could take a look at how Sony cleverly groups screenshots by app/game on the PS Vita software. Figure out Messages attachments. We've all been there: a lot of available storage seems to be missing on a device, but attachments you've received through messages are actually taking up that space. Right now, the solution is to a) delete entire message threads that contain attachments or b) manually scroll through a thread's history and delete individual messages; neither is great. According to rumors, Apple is considering a way to automatically archive old threads, therefore also purging attachments from the Messages app. Personally, I would like to see different approaches: store a received message in the cloud first, then download an offline copy if the user wants it; if the user wants to free up space without deleting a thread, it should be possible to remove local attachments while the original copy is stored somewhere else but previewed in the message thread. 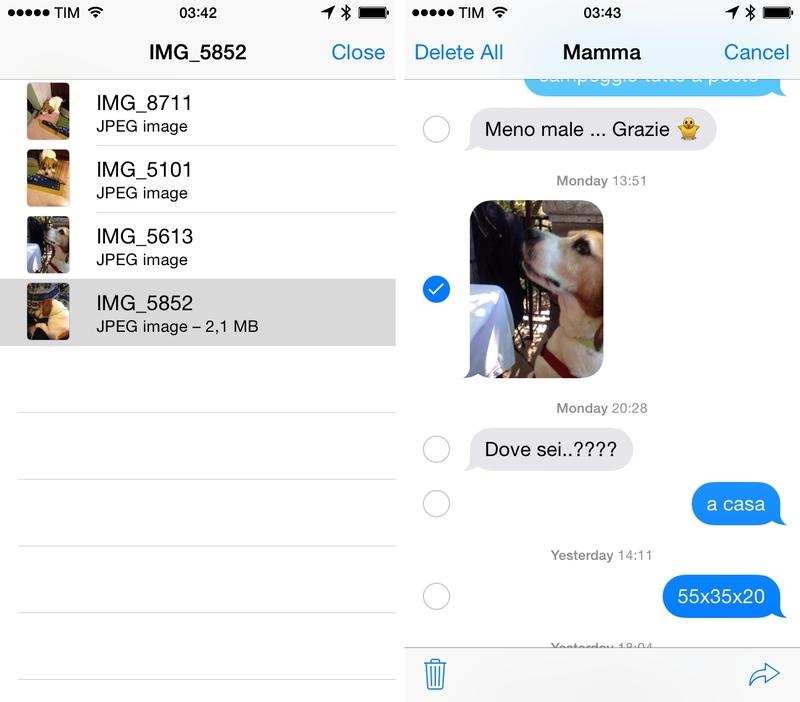 For photos and videos that you send from your device, iOS shouldn't keep two copies (one in the media library, the other in the Messages app) – it should send the original file without duplicating it. Add contacts to groups. If you want to add a contact to an existing group on iOS, you have to get a Mac and do it in the Contacts app for OS X. That doesn't sound like a post-PC feature. New group messaging options. Apple's offerings for group messaging in the Messages app are underpowered when compared to Facebook Messenger or WhatsApp. In Apple's Messages, you can't add people to an existing group, you can't mute individual threads (we even proposed a solution for this two years ago), and you can't archive conversations or leave groups. 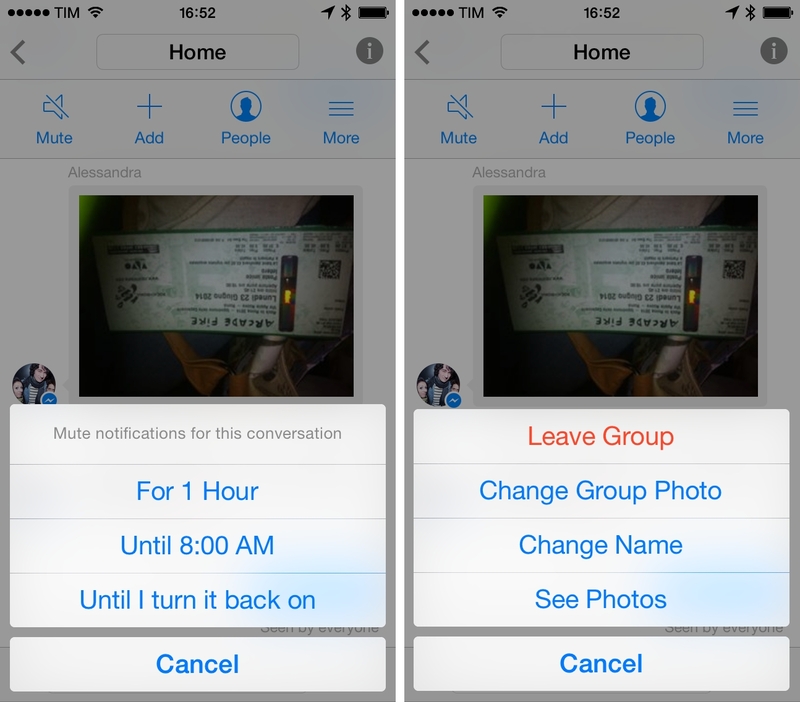 Facebook Messenger has handy options for mute settings and attachments in group conversations. In three years of iMessage, Apple is still stuck on the basic feature set originally conceived for iOS 5, and it's time for an upgrade. Read receipt settings. Read receipts are great when you want somebody to know you've read their message…and they're also not-so-great for the same reason. As usual with Apple apps on iOS, there are no granular settings: you either activate read receipts for all contacts and conversations, or you turn them off. What if you want to let your significant other know a message has been read, but prevent that annoying coworker from thinking that you're ignoring him? Pin apps to Control Center. The convenience of Control Center's quick access to toggles and Apple apps is indisputable, but I often wish I could swap those Clock and Calculator icons for apps that I want to quickly open from anywhere. Control Center's existing Settings screen contains only two options, and Apple could easily add an app picker to configure the app shortcuts you want to have in there. Improve iWork collaboration features. It's fair to say that Apple's iWork collaboration features can't be compared to what Google offers in Drive – especially if you consider how collaboration has been implemented in iWork for iOS. If you want to collaborate on a document with someone else in real-time, that's currently not possible – unless you want to take action multiple times thanks to errors created by iCloud. Google Drive for iOS has set a high bar for document collaboration, and I hope that iOS 8 will bring updates to make iWork faster and more capable. More keyboard shortcuts. Apple added proper support for external keyboards in iOS 7, but the shortcuts they've implemented are inconsistent with their OS X counterparts, half-baked, and not documented. For instance, you can't send a text in Messages with a keyboard shortcut but you can in Mail; in Safari, you can create and manage tabs but you can't move across them. Consistency aside, I'd also like to see new shortcuts for switching between apps in the multitasking view (CMD-Tab? ), Spotlight search results, and suggestions in the Safari address bar. Safari download manager. If you want to download a file from the web on iOS, you have to rely on Apple's Open In system for Safari or get a dedicated app like iCab or Documents. Safari doesn't have an integrated download manager (again, an aspect that's long been fixed by the jailbreak community), making it an inferior choice to Safari for Mac if you need to download files on iOS. Safari push notifications. I don't like allowing notifications for every app on my devices, but I've enjoyed the ability of staying up to date on news from my favorite websites with Safari on Mavericks. The initial implementation of Safari push notifications wasn't perfect – notably, Apple tweaked Safari 7 to include an option to never prompt for notifications – but it was good enough to build a collection of websites that can send you alerts for new posts. I'd argue that this feature could make a lot more sense on iPhones and iPads because they're mobile and portable, and it would be nice to see push notifications come to iOS 8's Safari. Print to PDF from browser and Mail. Speaking of Safari, Apple's browser has long enabled users to save webpages as PDFs on OS X, but that feature has never found its way to iOS. “Save To PDF” could become a new option in the existing Print menu, saving PDFs locally or offering to open them in other apps like iBooks, Preview, or Evernote. While they're at it, Apple could also make Save To PDF a system-wide option available to Mail (a potential boon to paperless workflows) and third-party apps. This option would single-handedly cut in half the number of tasks I need my Mac for. Inter-app communication. One of the reasons why people often proclaim that it's impossible to get work done on iOS is the lack of proper communication between apps. I've brought up this specific point for the past two years, and after iOS 7 and without a standardized system to let apps exchange files, data, and actions, Apple has undoubtedly fallen behind Google and Microsoft with their solutions for Android and Windows Phone. When I mention inter-app communication on iOS, I don't refer to URL schemes or bookmarklets: those are hacks that have become popular among geeks as workarounds to speed up some productivity tasks using tiny holes in Apple's sandbox. With an official API for inter-app communication, Apple could make using multiple apps for a single task a more pleasing and powerful experience for all users, not just iOS automation geeks. This is an important distinction: iOS is about inclusive empowerment and making complex things accessible to everyone. I have written dozens of articles on URL schemes and, believe me, I would love if they became obsolete with iOS 8. An automated workflow based on URL schemes. With an inter-app communication system, Apple could jump past the limitations of Open In and let multiple apps collaborate on a document without scattering duplicates across iOS. For example, you could save a webpage as PDF from Safari into Evernote then edit it with PDF Expert without creating three duplicate copies. Want to attach a file to an email message? A document picker that looks into app libraries lets you choose a file you have in Skitch and another one you keep in Dropbox. Need to turn an email into a reminder? No need to rely on Mailbox's own todo system or install Dispatch only on your iPhone – the iOS 8 Mail app lets you turn messages into todos thanks to a new share sheet that can communicate with Reminders, OmniFocus, Due, and other apps3. No more copy & paste, no more switching between apps multiple times to copy every item you want to save. iOS already has a basic system for inter-app communication (see footnote above), and Apple just needs to believe in it as a solution that, if fully baked, could save customers time and make them more productive. There will be security concerns: do you trust apps to move your files around without saving duplicates (could Versions come to iOS for this reason?) and are you comfortable with software reading data4 from outside their sandbox? Can developers opt out of the system (you wouldn't want 1Password logins exposed to other apps)? Fix the Music app. With iOS 7, Apple made the Music app more difficult to browse for people who like to listen to albums; more cluttered with the addition of iTunes Radio; and, they didn't improve playlist management. 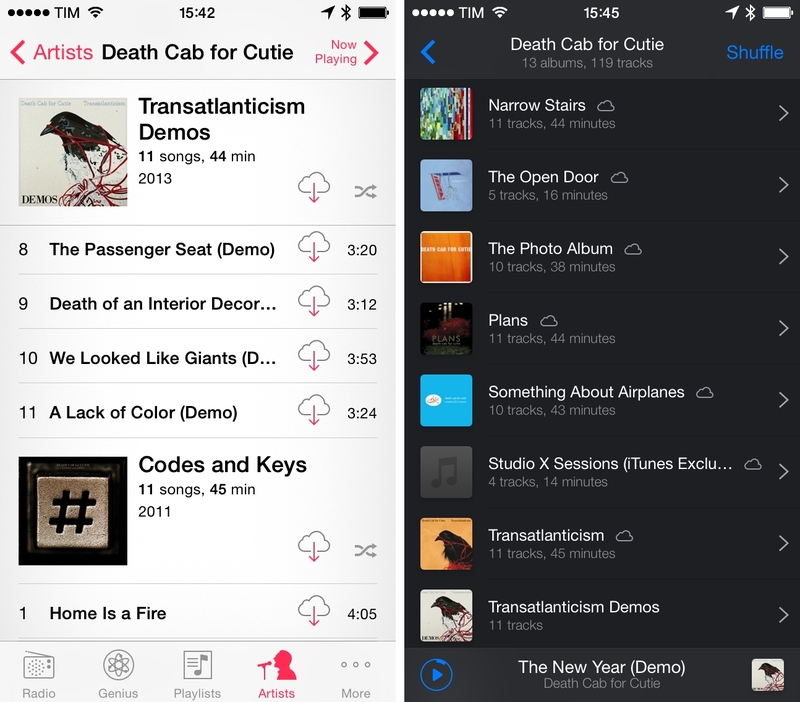 Ecoute for iPhone (right) provides a compact visualization of an artist's albums. Do you know how to add a song to a playlist on iOS? It takes five taps and a lot of scrolling. In iOS 8, I'd like to see a simple action menu to quickly add a song to a playlist without navigating to the Playlists view and manually pick it from there. For albums, I'd like to see a return to the old pre-iOS 7 design that didn't show songs inline within an artist's album screen, making artists with large discographies impossible to scroll through (Ecoute does it right because it's what Music used to do). The Now Playing screen of iOS 7 is bland and boring, whereas the one Apple used for the Remote app on iPhone is colorful, lively, and just as functional. Up Next in Music. Up Next is my favorite feature of iTunes on the desktop, and it's baffling that Apple still hasn't brought any sort of queue functionality to iOS. Alongside a button for playlist management, there could be one to add to Up Next, which would have a dedicated view in the Music app (possibly also accessible from a shortcut in Control Center with options for reordering songs on the fly). Search for iCloud Keychain. I'm loving the simplicity of iCloud Keychain and how it integrates with Safari when saving or creating passwords, but I wish I could search for items saved in iCloud Keychain. In case you didn't know, you can view items you've backed up in iCloud Keychain in Settings > Safari > Passwords & Autofill > Saved Passwords, but there's no search option to look for a website's name. If Apple doesn't want to make a full Keychain app for iOS (with logins, credit cards, and perhaps secure notes too? ), then a simple search bar in this screen would help. Power consumption statistics by app. Users shouldn't have to figure out empirically that the Facebook app drains an iPhone's battery. On Mavericks, Activity Monitor shows the Energy Impact of each running app and process; with iOS 8, Apple could add power usage statistics similar to the ones they have for storage and cellular data, only this time focused on battery consumption over time. There could be a rating system in place that generates automatic reports based on how much power an app requires; if something is wrong with an app that makes an iPhone excessively warm or subject to higher power consumption, the user will know. One more thing: travel times sync back to iOS as regular alerts that don’t have any location data attached. In a parallel universe, Apple did ship a travel times feature that fired off a notification on your iPhone, specified that it was related to a travel time, and that opened the Maps app to give you directions to drive to an event’s location. In our sad and unfair universe, there is no distinction between a travel time alert and a regular alert on iOS, and everything just shows up as a unified “alert” in Apple’s Calendar app. Third-party iOS developers don’t seem to have access to travel times created on Mavericks either. For iOS 8, I hope that Apple will bring travel times and weather information – two useful pieces of metadata when creating events and managing your schedule – to the Calendar and Reminders apps, enabling them at an API level for developers too. Both features are backed by existing iOS apps (Maps and Weather), and it doesn't make sense to keep them exclusive to OS X.
AirDrop to Mac. With iOS 7, Apple blessed iPhone and iPad users with an easy way to share files locally with no Internet connection required – AirDrop. Available in the system share sheet that's used by Photos, Contacts, and many other third-party apps by default, AirDrop is convenient but it has one caveat: it's not compatible with AirDrop for OS X. The reason why Apple didn't enable cross-platform AirDrop support last year was likely tech-related rather than a design decision (AirDrop is only available on modern iOS devices, and it may be tricky to get it to work reliably with older Macs that don't share the same Bluetooth and WiFi capabilities), so I'm hoping that Apple had time to figure out an elegant solution to let iOS and OS X users quickly exchange files. Has iOS 7 empowered people in new ways? It's easy to judge iOS 7 in terms of “flat” design, number of new Apple apps, or things that went wrong. The fact that iOS 7 could have used more polish and, more importantly, stability without crashes is indisputable. The jury's still out on iOS 7's long-term impact on Apple's reputation – only time will tell – but it's also undeniable that the company has succeeded in turning the App Store upside down to enable developers to completely rethink their apps. With background refresh, new text APIs, Control Center, M7-powered motion data, and dozens of other new technologies, iOS 7 has fostered the creation of new, more versatile software. How can iOS 8 empower more people while improving upon iOS 7's missteps? Is it time for iOS to grow up and take inter-app communication seriously? Will Apple primarily focus on health-related software ahead of a possible wearable device? Will the iPad get the iOS it deserves to become a true post-PC device for everyone? We'll know in 40 days.